Axel in the driver's seat, locked-in and ready to ride. Ken Burdick photo. I attended the Jim Walker Memorial contest in April 2018. They did indeed have hot dogs, trucks and a special guest named Axel. Axel, according to Diane, is “Mike’s dog” no two ways about it. I have known Mike and Diane Rule for many years and they are what folks commonly refer to as good people. Diane and Mike have rescued untold numbers of dog, cats, and who knows what else. It was a foregone conclusion when it became evident that Axel needed a new home. 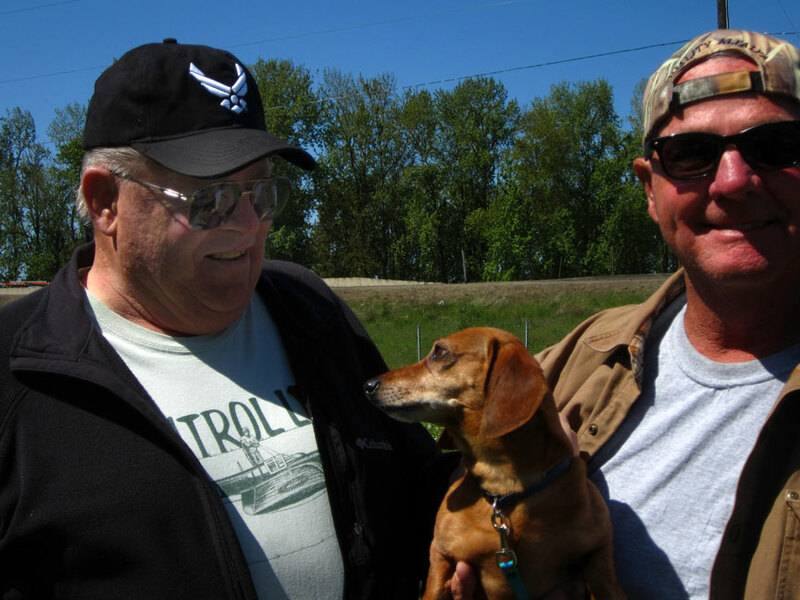 Mike Rule and Axel in the Combat pits at the Jim Walker Memorial. Ken Burdick photo. You know the expression, "Boy meets dog"? Exactly the case here, and after one look for boy and dog it was love at first sight. Wherever one was, the other was, too. They were, to simply state it, inseparable playmates. This wee bit of a bowser has learned the joys of control-line flying, chasing after many a Combat wing, Speed plane and Racer. If it goes in a circle and makes noise, then it’s game on. Mike Rule is a big man, stature of around 6’ 6” and Axel about six foot less than the apple of his eye. Diane said, “He just tolerates the rest of us, he’s Mike’s dog". So, life goes on and all is relatively well until four years later, when a convergence of dog-driven storm clouds appeared on the horizon of an otherwise sunny day. 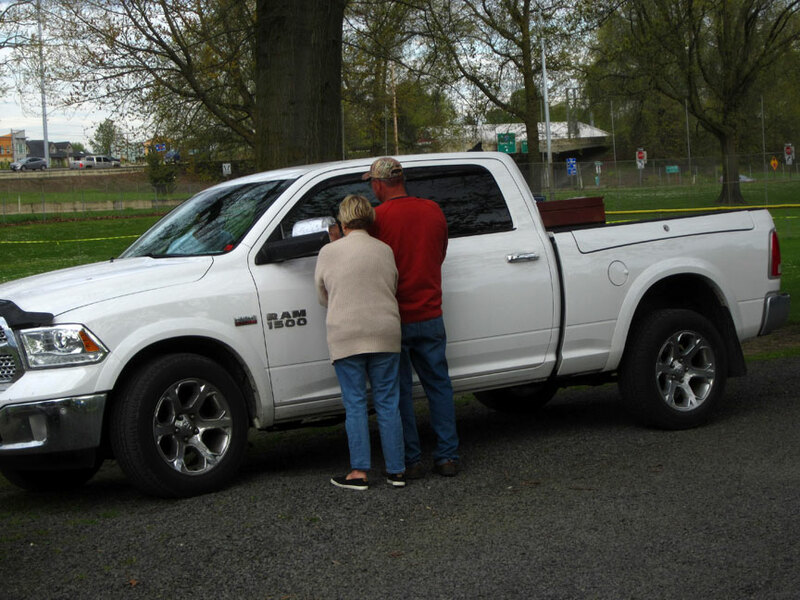 Diane and Mike negotiate with Axel, who has the keys to the Dodge. Ken Burdick photo. So, if you google the subject of “Can I lock the keys in my new Dodge pick up truck?” you will see how brilliant eeeelectronic engineers have created a key fob that will not allow the doors to lock if the key is inside the truck -- right! The locked door will magically unlock itself, very brilliant. Now, what the boys in Detroit didn’t plan on was Axel. 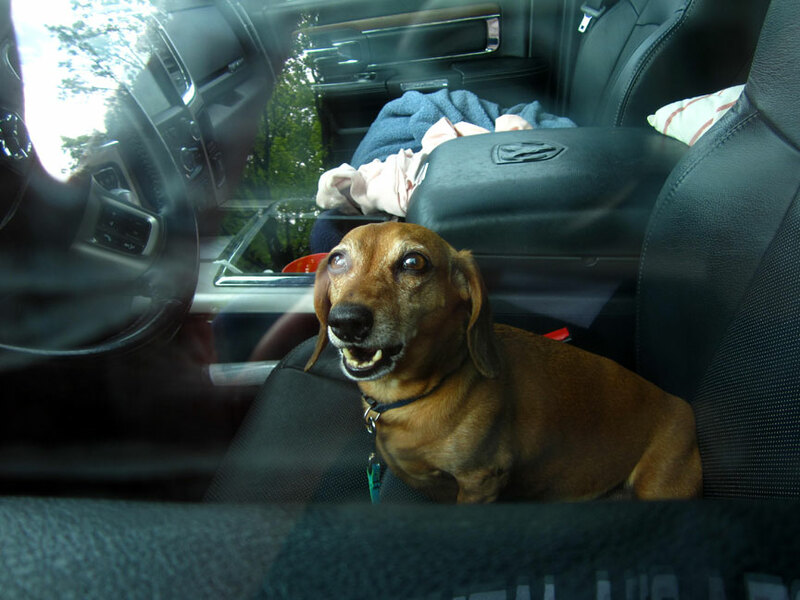 It is possible to lock the doors with the key inside if you lock the doors from the inside, like you do when you are driving, or if you are an excited Dachshund who happens to jump up and down on the lock button located on the horizontal armrest. 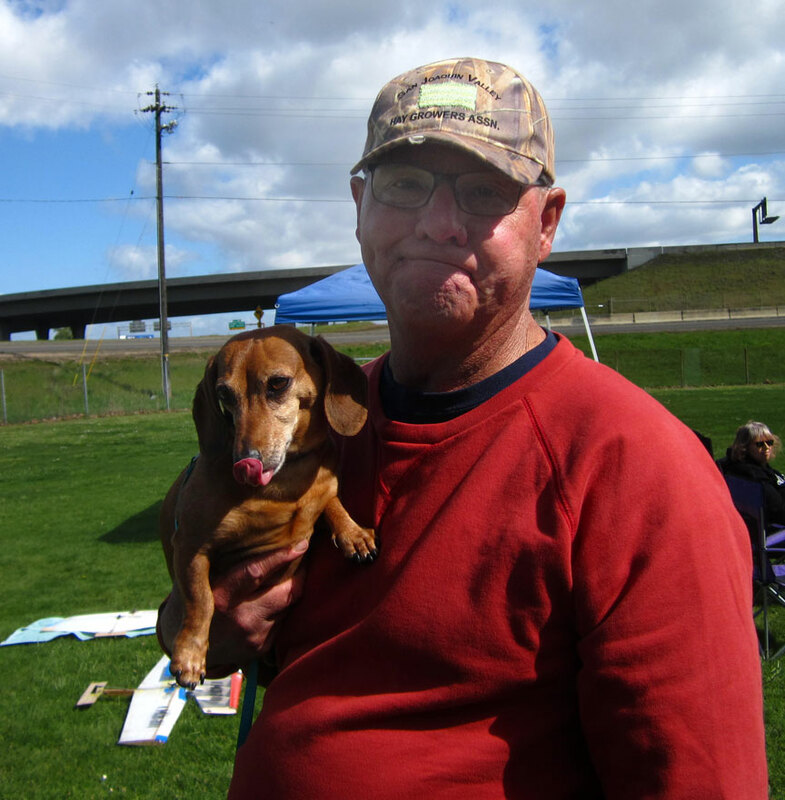 The keys in this ill-fated tale were in Diane’s purse in the truck alongside the wiener-dog. I first noticed the kerfuffle around 2 o-clock Saturday afternoon. Mike and Diane were both staring into the driver side window with Axel staring right back at them. “He’s locked himself in the damn truck,” Diane replied. “Don’t you have the keys?” I asked. The lock button. Ken Burdick photo. Both Mom and Dad tried to coax Axel over to the window where he might step once again on the magic button and release them from their canine-induced exile. It was met with wagging tail, but little more. I tried and didn’t even get a wag. Mike is a pragmatic man and finally said, “He got himself in there, he can darn well get himself out,” and walked off to the Combat circle. I asked the usual questions, like, “Can Onstar unlock it?" Or, "Call AAA," and on down the list of everyday solutions. Onstar was available for this model the following year, AAA had left Diane in a fix once and they were not on speaking terms, but the Dodge dealer might be an option. Working on Plan B. Ken Burdick photo. You know how dogs will like someone for no apparent reason? They can also dislike with the same baffling logic. It was now three hours later and the stand-off was getting into full stride. 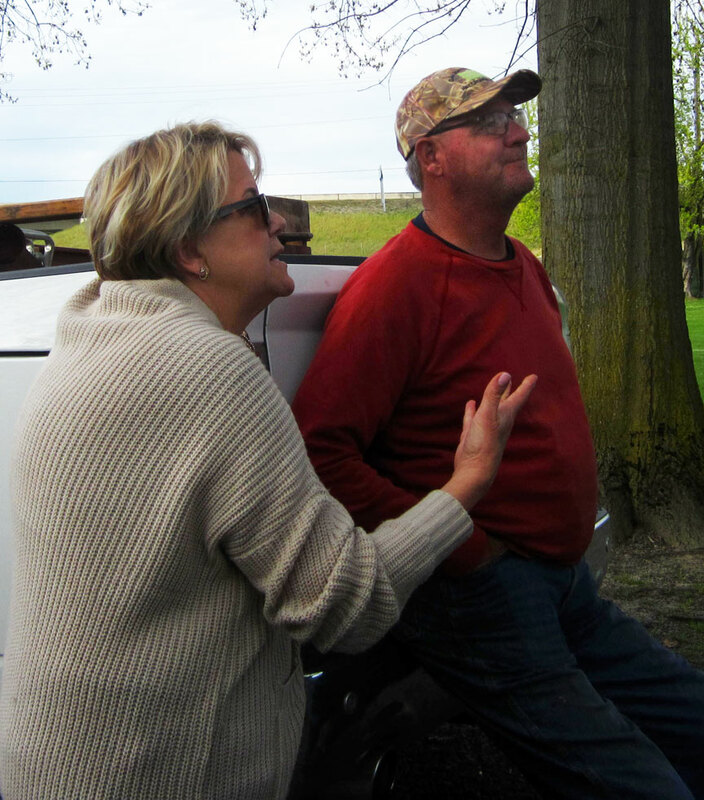 Mike and Diane were sitting on the bumper of the truck, while Axel peered out the windo., A stalemate if there ever was one. I was leaving and wished them well. They said the dealership was going to stop by at some point. They looked defeated. And I headed off to my cousin’s house for dinner. It was at this time that good fortune smiled on our hapless trio, It’s like the saying about one door closing and a window opening. Well, the window happened to be in the form of Ron Anderson. Ron was simply walking by when Axel noticed him. Ron is a large man and perhaps Axel thought him an intruder to his fortress of solitude. Whatever it was, Axel sprang into action, barking and tearing around the inside of the dog-locked vehicle with a vengeance that his mom recognized immediately. Ron complied and the terror known as Axel now was not only protecting his jail cell, but his mom, too! Snarling and barking commenced for some time, and all the while Axel’s mom had her eye focused on the lock button and her hand firmly planted on the door handle. The lock button finally succumbed to the dancing dog and popped up while in the same instant Mom quickly pulled the door handle before the bouncing bowser could relock it. Dog and family were united once again. Ron Anderson, Axel and Mike after the crisis is averted. Ken Burdick photo. 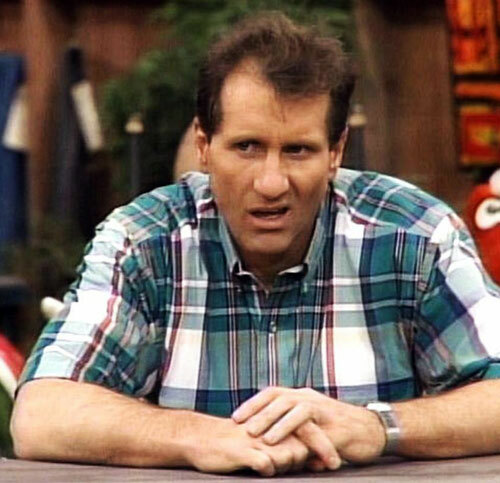 Mike didn’t win Combat that weekend as he had at the Regional championships the year before, but he won our hearts as did Axel and Diane, who had the quick wit to see the solution to this doggone conundrum. When friends get together, and there is a fellowship such as the Combat community has, these wonderful bits of life can and do happen while we, the bystanders in this comedic play all wait for the next time.